The full name of Hashim amla is Hashim Mahomed Amla. 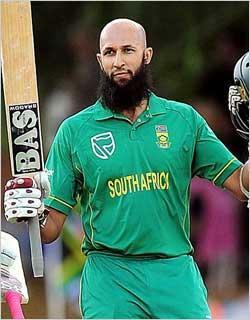 Hashim Amla is born in 31st march 1983 at Durban, Natal Province, South Africa. Hashim Amla is one of the consistent batsman in current South African team in both test and ODI cricket. This right handed batsman is the No 1 batsman in ODI cricket of ICC cricket rankings. In limited over cricket Amla will open the innings for South Africa. Hashim Amla made his test debut in the year 2004 and ODI debut in the year 2008. Hashim Amla test debut begins with some poor performance but later on he come back with some amazing batting performances. In 2006 Amla scored 149 runs in a test against Newzealand which helped south Africa to draw the match. Another notable performance of Amla is in 2008 march 27 where he scored 159 against India. In the year 2010 Amla showed his amazing skill in batting which is the best year in his Cricket career. Hashim Amla highest test score 253 not out was made in 2010 against India. He again scored 123 runs in second test of the same series against India. Hashim Amla scored four centuries in test cricket and one in ODI cricket in the year 2010 where three was against India and two against Pakistan. His top performance made him to reach the No 1 ODI position in ICC Cricket rankings.Hashim Amla's elder brother Ahmed is also a best player in First - Class cricket and he was the captain of Dolphins. Hashim Amla scored 12 centuries in Test cricket and 8 centuries in ODI which shows his amazing talent in International Cricket.